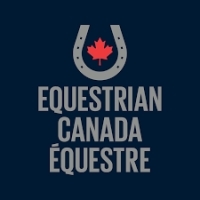 Canadian athletes stole the show with numerous top-three placings at the Cedar Valley CDI 3*, held June 15-17, 2018, in Cedar Valley, ON. 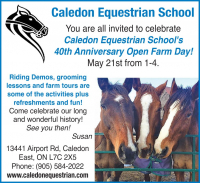 40 years ago this summer, Susan Fripp moved to a farm in Caledon East to start her dream of creating a riding school for everyone from all walks of life. 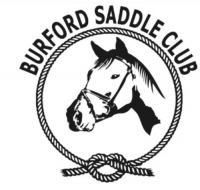 Susan was in the middle of the Equine Studies program at Humber College and she figured she knew just about everything about horses. 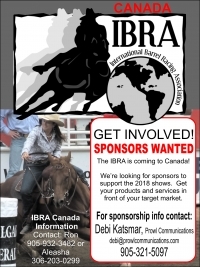 Farm life quickly fixed that illusion and she has been learning and sharing her life long education about horses ever since that summer. 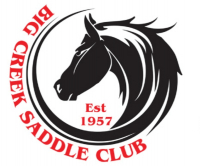 Join Us For A Full Day of Horse Showing And More at the Big Creek Saddle Club! 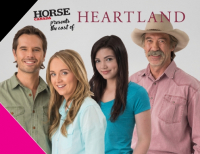 Amber Marshall (Amy Fleming), Graham Wardle (Ty Borden), Shaun Johnston (Jack Bartlett) and Alisha Newton (Georgie), will all be in attendance on Sunday April 8 at 4:30pm in the Main Arena. 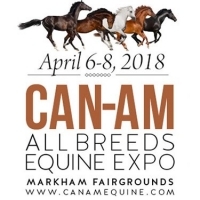 Eastern Canada’s premier equine event will take place April 6-8, 2018 bringing together thousands of horse lovers and industry partners all under one roof for a great weekend for everyone from the seasoned horse person to the weekend rider and everything in between!